In the March issue of TGO, just out, my backpacking column is about the Continental Divide Trail, the longest hike I have undertaken. In gear I review GPS mapping units and look at the future of GPS for the outdoors. Elsewhere Judy Armstrong reviews waterproof jackets for women, John Manning tests the new Osprey Manta 25 pack and Cameron McNeish describes the gear he used on a backpacking trip at the end of last December in bitterly cold weather. 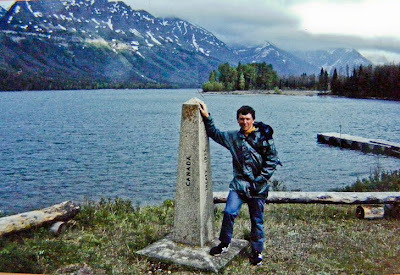 Photo info: On the Canada/USA border at the start of the Continental Divide Trail. Pentax MX, Tamron 35-70 lens, Kodachrome 64 film. No exposure details. Scanned slide tweaked in Lightroom 2.5. Actually, it's not a waymarker. It's a border post. There's a whole line of them right along the USA/Canada border.